Starting a new once again, I have made yet another thread for my art. The 4th or 5th one I believe. My other threads are full of dead links and are bad to me so I want to start once more. I'm going to post fresh pictures, so starting from my newest art. I have hardly anything new to post to start this thread since I've barely done a thing since Larry Pine. I'm hoping a new topic will help with that. Starting off with my newest thing. 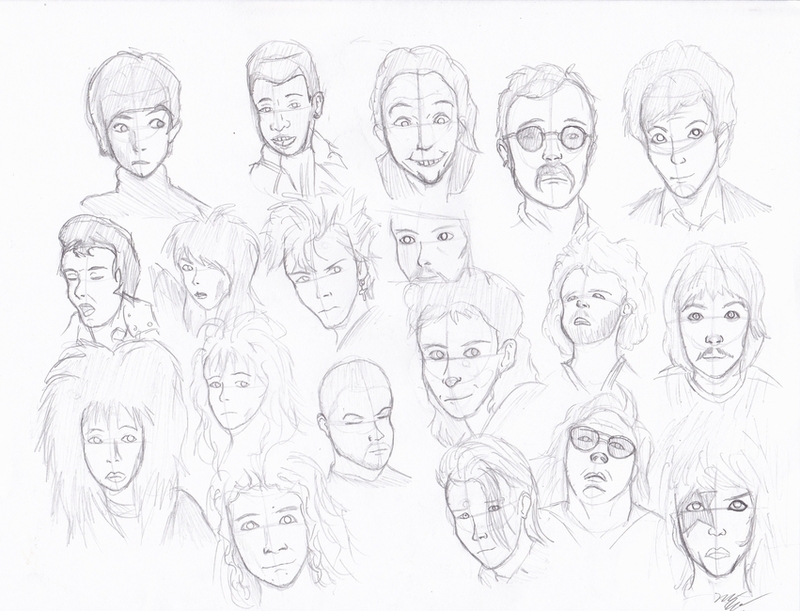 I just did this earlier, I blindly grabbed random records and sketched a face from each. Lots of long haired dudes...I need to work on drawing faces faster, the quality here ranges from meh to terrible but it's what it is. I gotta do it more, good practice to capture the differences in multiple faces. 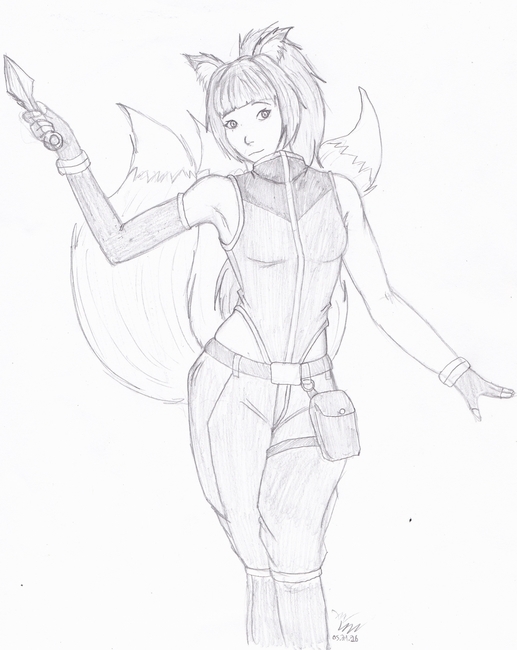 I posted this before but this is my drawing of Razi's character Hikari for our art trade. This is pretty recent. Some recent comic pages. I have a whole thread for my comics, this is for my other art. But I will post this anyway. The first is from March, the second April. So ya let's try this again. As always I am open to critique and stuff of that nature. Special links to my other art threads. Love the different faces. It is always good to draw multiple facial structures and angles. Sadly I don't know the classics very well despite being raised by elders, the only one I recognized is Elvis, lol. Yay, Hikari! I think the outfit came out really well, like you captures the volume of the pants, top, gloves, and thigh bag/pack. As a criticsim goes to this image, I feel the arm anatomy could need a little work- just shape and portion wise. I personally feel one is shorter then the other and that the forearm doesn't tapper down to the wrist - stays decently the same thickness when it should tapper down a little before the wrist. As comics go, they are pretty interesting! A lot of action is on the pages. I feel you are trying to capture a dynamic view point with the angled pages and angled panels. Maybe work on more straight forward panels so the picture doesn't look tilted overall? You can still draw tilted images for those dynamic view points but with solid framing i think will help not feel like the entire page is tilted. Thanks, the faces where fun. I want to do it again. I just pulled records at random, the hair metal guys are hard to do actually because they have challenging hair. Ha, ya of course Elvis is the most recognizable, Paul McCartney & Paul Stanley as well. There are three guys here that I don't even know the names of! Hhhm, yes the arms are certainly the weak point there. I am still in a constant struggle with arms/hands, but I am better then before atleast. I wanted to make sure her pants sat correctly, I did a previous take where they looked 2 seconds away from sliding off. Since those two are opening shots I decided to do some weird things. I have done a lot of comics so now whenever I do something I try to experiment when I can and find weird things I can do. The first comic page looks good, the positioning of the characters is interesting although it's a little hard to tell what is going on. As for the second page, the perspective on the bottom panel looks pretty good although I think I was staring at it too long and got confused. And I really like the leaves floating across the page. No anime is this wild. Maybe the first page is confusing...I wanted to make it jam packed. 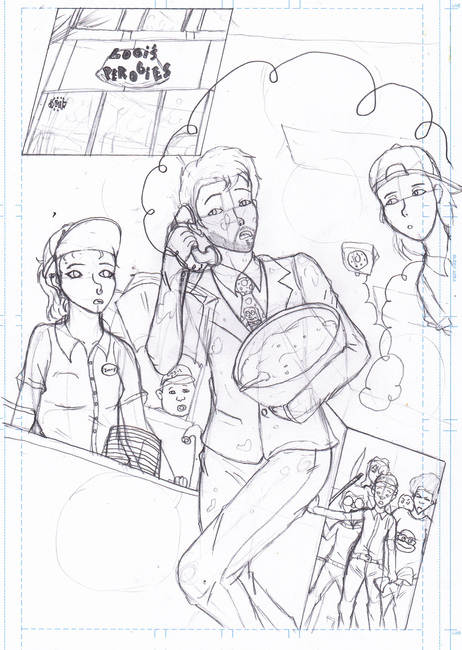 The guy is running through a kitchen, a phone swinging around, carrying a bowl of dough while employees call to him and someone in the back tries to hold back angry customers. With speech bubbles added it would make more sense. I can see how the second could be confusing. I meant to make it feel breezy and quiet so I put the leaves all over to set a Fall tone. nice faces, cant say i recognized anyone but thats more me than you. Starting a new comic, we'll see how it goes. 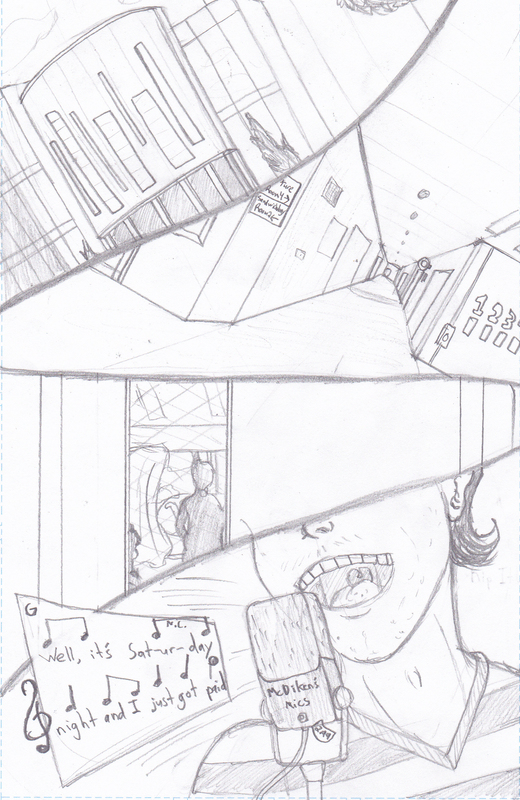 I came up with an idea last night, scribbled basic design elements and did 4 pages of storyboard in like 2 minutes. My comics are best when unplanned so we'll see where it goes. 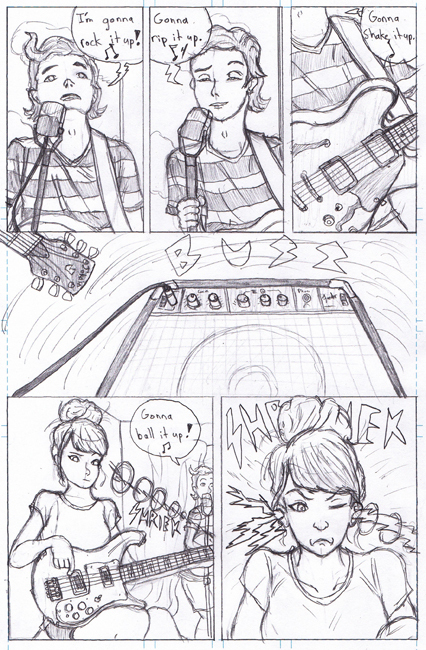 The idea is a music comic with tabs and stuff put into the music scenes. I wondered how to make music work in a silent format so I'm going to try a few things. It's about a group of college losers who play together and all of them are terrible at it. Might ink it if I do more. Neat poster BobbyJoe, ya it would be like that if it had more. Suuper, ya that's the best way to do it for me. If you plan it too much you'll just keep planning and never get anything done. I've written so much of Mango P.I. that it's like "I'll never get all this done". So my goal with this story is just think about what I want to do and let it come naturally. I haven't even drawn real character designs, I'll figure it out as I go. My comics are better when spontaneous. We'll see how the art looks when the instruments come in. That will be very tough, I'm going to have the characters use my instruments so I can get every kind of reference picture I need. That is a failing with not planning. In my school series I would introduce plot lines and pretend they never happened because I didn't know what to do. For me I just need to draw, I don't want to spend a lot of time planning because I want to draw, and to stay productive I need a comic to make, so I'm going to wing it through this one. My comics are my practice. 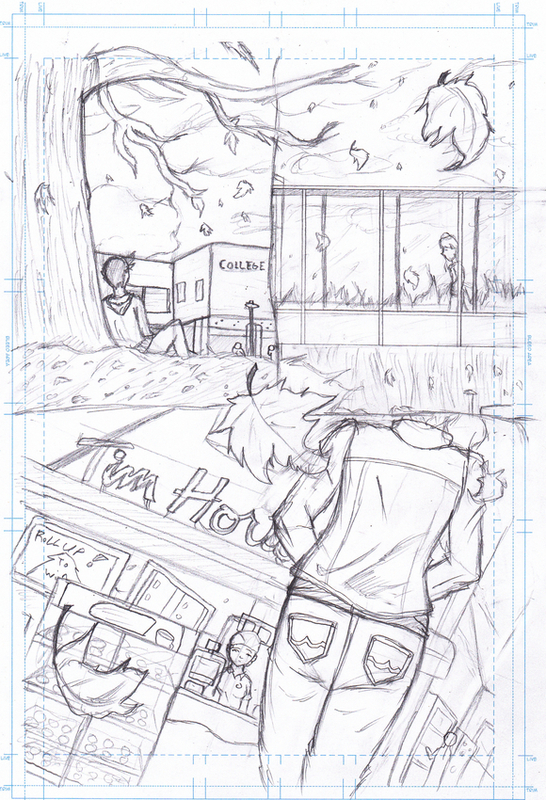 So here is page 2, now it gets hard. If I ink it a lot of things will be fixed. 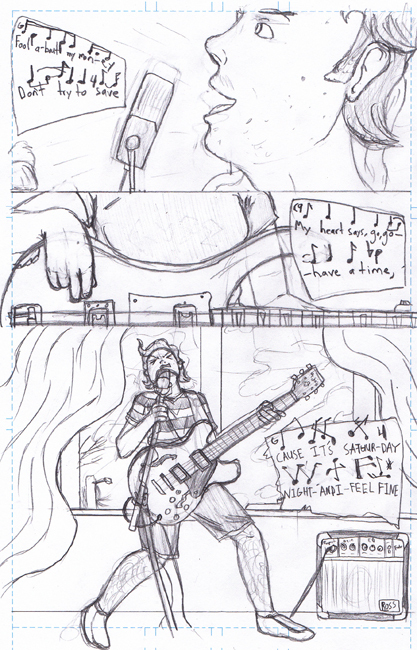 This was fun to do, I like drawing instruments and people playing them, even if it's very hard. The singer's guitar is emitting feedback since the volume is cranked he's letting it shake around. Don't know if I display that well enough. You've watched BECK before by any chance? Could be something to look for in terms of inspiration. Looking good Manimal, and I felt that feedback from here. I hate it when that happens. Those poses can't have been easy to make, along with the instruments. I wonder, do you know the tune to the song the players are playing?